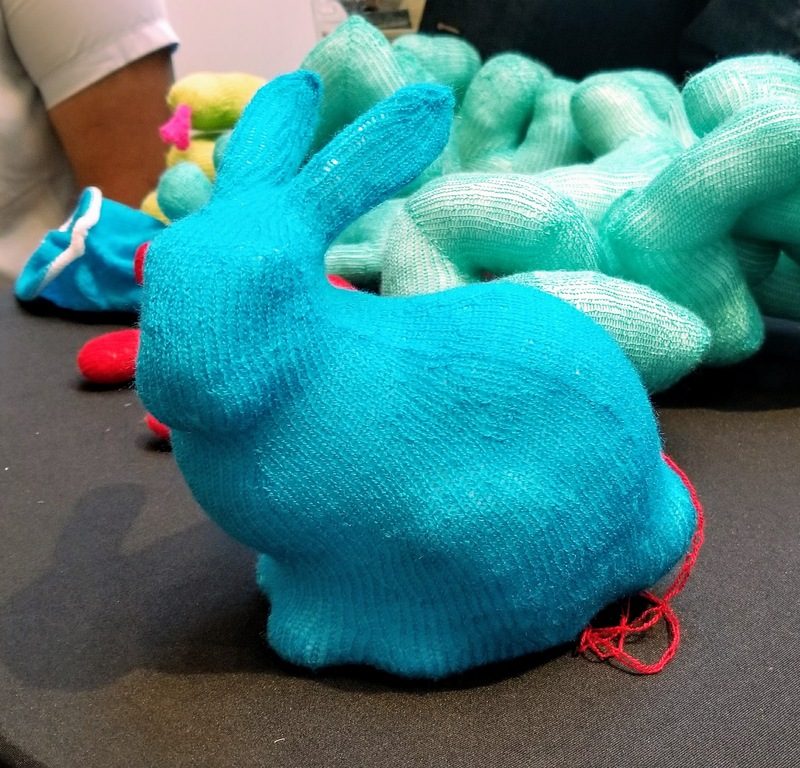 Recently (by which I mean 1.5 years ago now) I saw the ubiquitious 3d printer bunny, but in knitted plushie form. SO COOL. Where was I? 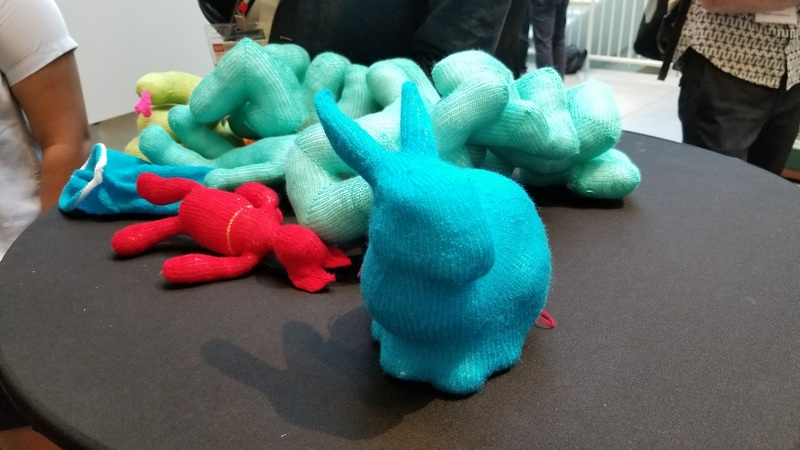 I was passing through the ACM Symposium on Computational Fabrication (on 12 July 2017), and saw a table full of plushies. 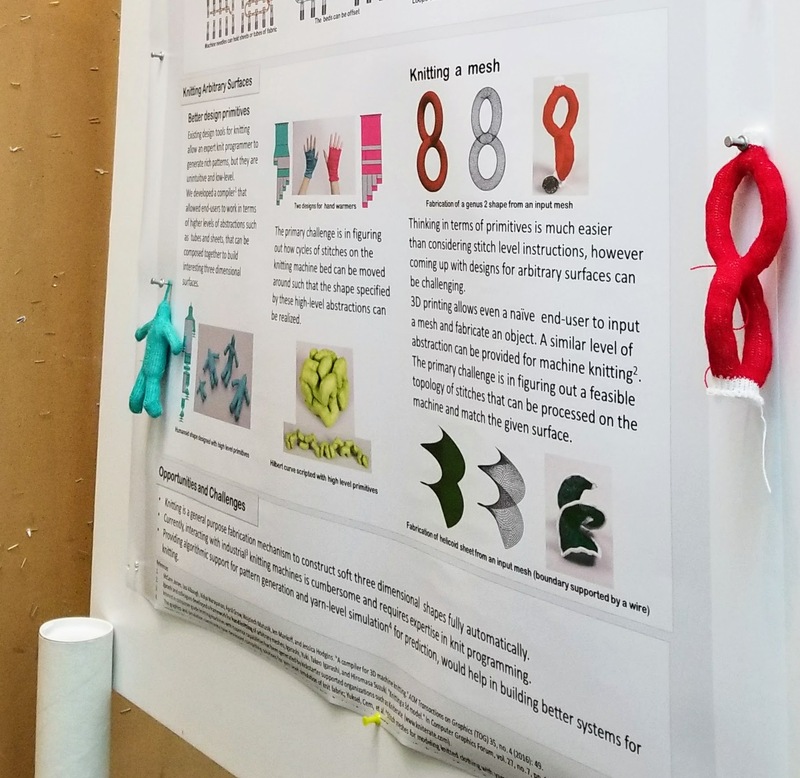 (The symposium was held in the lobby of one of the MIT buildings, so it was easy to walk through and see cool things — I love that kind of format). Of course, I immediately had to stop by and see what was going on. And yea, this person’s computer science research literally involves plushies. Here’s the abstract on their paper, which describes how to turn 3d meshes (such as the STL files for the 3d printer test bunny) into CNC knitting machine patterns. We present the first computational approach that can transform 3D meshes, created by traditional modeling programs, directly into instructions for a computer-controlled knitting machine. 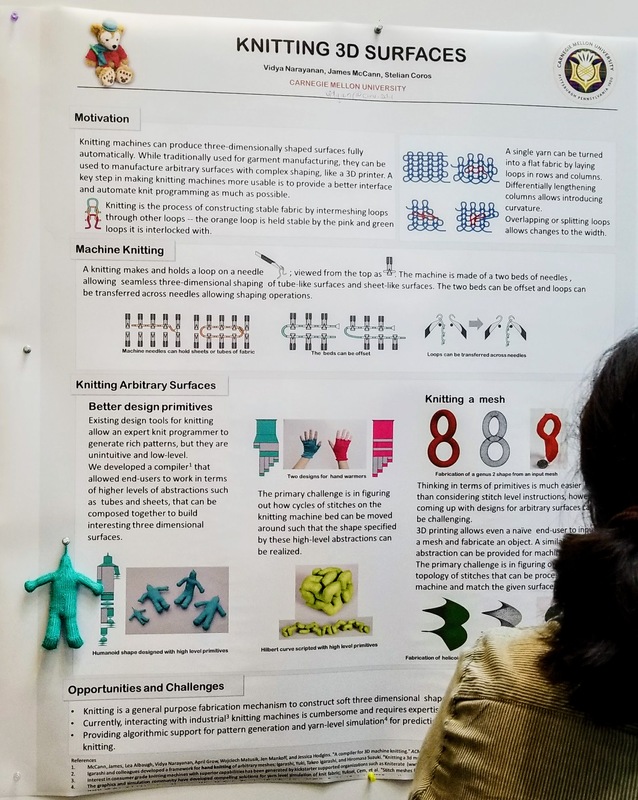 Knitting machines are able to robustly and repeatably form knitted 3D surfaces from yarn, but have many constraints on what they can fabricate. 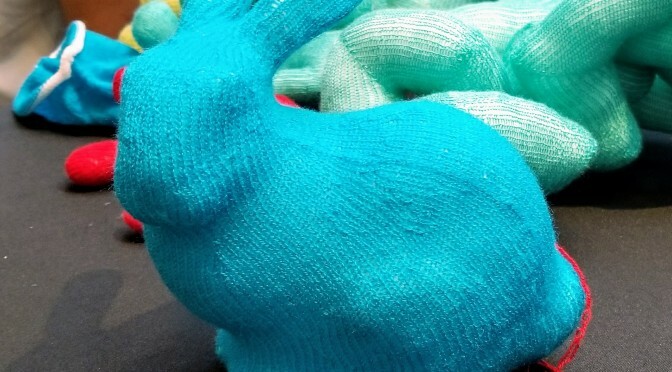 Given user-defined starting and ending points on an input mesh, our system incrementally builds a helix-free, quad-dominant mesh with uniform edge lengths, runs a tracing procedure over this mesh to generate a knitting path, and schedules the knitting instructions for this path in a way that is compatible with machine constraints. We demonstrate our approach on a wide range of 3D meshes. It talks a bit about whatever is going on in this image from the paper. (I think it’s cool to see how different the “flat” pattern in image 5 is from the “3d” filled plushie in the final image). A few more pictures can be found here: Google Photos Album. Why doesn’t my academic life involve both getting academic acclaim and making plushies for work? 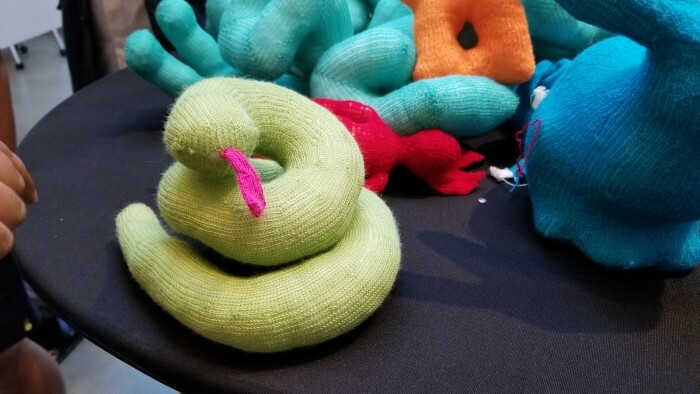 Even if I encountered research setbacks, I would still have a pile of frankenstein plushies to lie in as I sob quietly and eat ice cream, or throw plushies with wild abandon.